The increasing number of Sisters encouraged Sister Xavier Bernard to expand into new foundations. In 1854 Sister Francis Creedon had opened the Immaculate Conception Orphanage at Mercy Convent. This building soon became inadequate. In 1859 Sister Xavier Bernard established St. Michael’s Convent and Orphanage at Belvedere, a property in St. John’s that had been bequeathed to the Sisters of Mercy by Bishop Fleming for that purpose. In 1861 Sister Xavier renovated the former orphanage at Mercy Convent for use as a boarding school for girls, named St. Clair’s Boarding School. Two years later she opened St. Bridget’s School in the East End of St. John’s for the instruction of poor children. Before her death in 1882, Sister Xavier had established foundations in Brigus, Burin, Petty Harbour, St. Lawrence and Conception Harbour. In 1884 St. Bride’s Academy opened at Littledale, St. John’s, as a boarding school for young women. In 1895 St. Bride’s became recognized as a training school for Catholic female teachers and for the next eighty years it played a key role in the education of Newfoundland youth. T he first foundation of the Sisters of Mercy on Newfoundland’s West Coast was at Sandy Point in 1893. It came about as a result of a dream of a wealthy American convert to Catholicism, Mrs. Henrietta Brownell. Mrs. Brownell provided the financial means for four Sisters from a Mercy Convent in Providence, Rhode Island to establish a mission in what was then a remote part of the island of Newfoundland. This was the beginning of the ministry of the Sisters of Mercy in what became the Diocese of St. George’s. In 1916 there were nine convents of Mercy in Newfoundland, each house being independent. Archbishop E. P. Roche initiated the move towards amalgamation. On July 1, 1916, the people of Newfoundland were notified that all convents of the Sisters of Mercy would be united under a central administration. Sister Bridget O’Connor became the first Mother General of the Sisters of Mercy, with the administrative offices located at the Motherhouse, Mercy Convent, Military Road, St. John’s. St. Bride’s, Littledale, was designated as the central novitiate. By 1927 six new Mercy convents had been founded in Newfoundland and the growing congregation had over one hundred and twenty sisters. 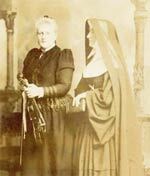 For the most part, Sisters of Mercy served as principals and teachers in many parts of the island of Newfoundland. In addition to their school responsibilities they lived a vibrant community life and continued to visit the sick and infirm in their homes or in other facilities. In 1922, in response to a long-felt need for a Catholic Hospital in St. John’s, St. Clare’s Mercy Hospital came into being under the administration of the Sisters of Mercy. In 1958, the Sisters of Mercy entered into a new phase of ministry when they agreed to administer and operate the newly-constructed St. Patrick’s Mercy Home for the Aged and Infirm, located in the centre of St. John’s. In 1961 the boundaries of Mercy were pushed beyond Newfoundland with the establishment of a mission in Monsefú, Peru. In 1988 the seat of the Peruvian mission was transferred from Monsefú, to the near-by town of Puerto Eten and in 1993 a second mission was opened in Ichocan, Cajamarca. The 1980’s and ‘90’s saw the spread of the Sisters of Mercy to Labrador. In 1984 a mission was opened in the small island community of Black Tickle and shortly afterwards the Sisters of Mercy filled various ministries in other parts of Labrador. With changing times new needs emerged. Sisters of Mercy responded in diverse forms of ministry, pastoral care of the sick, social work, ministering in correctional institutions, counselling, parish and diocesan ministry, youth ministry, spiritual direction, retreats, ministering to persons living with HIV and AIDS, promoting social justice issues and ecological awareness. In 1995 the first group of Mercy Associates was formed. In the following years the numbers continued to increase so that by the year 2017 there are more than one hundred Mercy Associates throughout the province.